"Quarrying is a fantastic subject. First of all we'd better bring some geology into it. The limestone of Tytherington is the Clifton Down Limestone and it stretches from the quarry entrance to the pub and that is all. It's less than half a mile wide. When the sea was laid down it has been estimated, by those that know - and perhaps you would say you have to have a big imagination with these subjects - 180 million years ago it was laid down as the seas came over and it stretches, basically like a horseshoe, you've got it from Clifton Down and you can see it by the motorway right through, right along through the back of Itchington, through to Grovesend, swings across the top of Tytherington Hill, Jones' Wood into Tortworth Lake, swings back again into Slickstone (Cromhall Quarry), back again into Wickwar, from Wickwar round again to Wotton's at Wick and then you're on down to Mendip. An interesting point is the other side of Chipping Sodbury is the last hard stone until you get to Norway, and that's why Tytherington is basically on the map. Tytherington stone has a crushing strength technically of 32,000 pounds per square inch, whereas if you go to the top of the Cotswolds where you see the Cotswold stone it's about 8,000 pounds per square inch. You have to have hard stone to make roads. So when that was laid down there must have been a terrific uplift which put that ridge around there. In future days others will go onto this subject because it's a fantastic area for minerals because as you know you've got the quartzite and you have got the spar and then you have got the coal measures behind Ashworthy and then if you go to Iron Acton - well that's self-explanatory - and then on again. That is what put Tytherington on the map. Well it's obvious that the turnpikes were still in action into about 1870 or just after that. Many of you remember the turnpike house at Bagstone, well those roads then had to be kept going by private means. 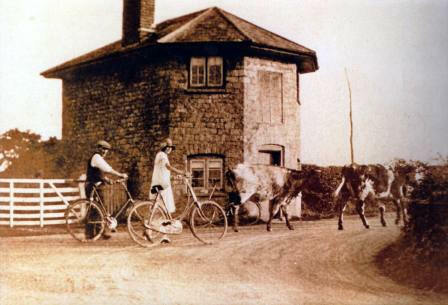 (Photo on the right shows the Pick family around 1920 passing the Bagstone Turnpike at the junction of Stidcot Lane and the Wotton-Rangeworthy road. The building was demolished in the 1960's) Between the 1870's and 1910 things really started to move and roads and the wheel was really beginning. We were on carriages, my mother talked about the carriage and pair and, of course, from then on roads had to get better. If you go on to Tytherington Hill you'll see that the rocks have got a dip where the uplift has come. well, those rocks are going down, right down, very very deep. If you go along by Dennis Skuse's (Bishop's Farm, Baden Hill Road) you can see where they are. Well it's pretty obvious that in Tytherington never underestimate our forefathers - by golly they had it there and they realised that as they were cultivating the land had to be purified. They were putting muck in and it would get sour so they had to do something about it, and so what happened? Tytherington had limestone so you burnt lime or you burnt stone to get lime. Well now I know about four (limekilns) in Tytherington or where there has been four, although Ted Oakey thinks there were seven. Well you will see one under Tytherington Hill which is nearly hit to pieces (now restored) there was one going up Stowell Hill towards the Vicarage, there was one on Itchington Field, there was one in Mr Matthews field up towards the slope of Baden Hill and I believe there is quite a strong possibility there was one up the New Road where you'll see a dip by Ernest Matthew's sheds in there in the wood. So lime and stone was being burnt in Tytherington, and that was making lime for purifying the land so the seasons could go on. So that was the start. Frank Pitt told me that in the records of the Church there was something about a sailor being found along by the limekiln in Tytherington in the middle of the 17th century. Well it's obvious that lime kilns go way back. Well coming back to actual quarrying. 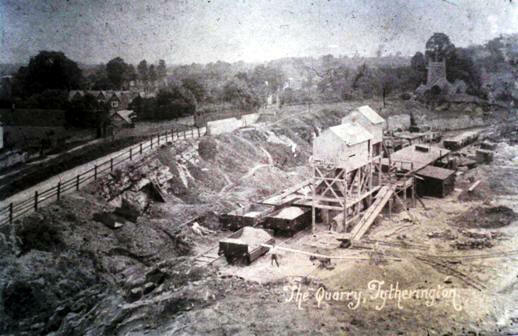 In Tytherington the Lord of the Manor, Mr Hardwicke, started developing the area and they went into the main quarry and the Church Quarry (pictured below, note the church on the right background) and started developing that. But while that was being developed I can remember quite well when a Mr Tom Tavender was breaking stone opposite Dennis Skuse's and he was putting it in piles called yardage. The stones were put down on the road and then were consolidated by the steamroller and then over comes the dust and over comes the water cart. At that time Mr Clements was active on that and he had the water cart working for the council and consolidated the road. So you can see how the carriages were going and the motor car was coming in and roads had to get better. To follow that then all you had, as many of us can remember, was a cloud of bally dust! So in the meantime you had places like Stapleton Gas Works, right by the viaduct which has been knocked down, which was making gas. Thornbury had their gas works down by the scout hut (on Park Road almost opposite Castle School). The gas works produced tar, and after the road was consolidated and rolled, the tar pumps came along and, as many of you can remember, tar sprayed again and some chippings on the top and you had a road and that's how things went. Well now, in the meantime Tytherington gradually expanded. I brought this down as a symbol. (Ambrose holds up a sledge hammer). If any of you care to lift it presently, it was the symbol that Tytherington was worked on. That hammer is 14lbs and that was slung from 7 o'clock in the morning til five o'clock at night. There has never been any mechanical means of breaking or loading or anything at all in the Church Quarry. There hasn't been a lorry in the Church Quarry. There's been no breaking or loading up by Mrs Grey's (West Street Farm) in the main quarry except by hand and pick and shovel. That's the only way it's been. There's been no mechanical loading at all. So as you can see things were going on. I've got to give a big gap now, things were going along quietly. A lot of men were walking from Rangeworthy, from Cromhall and also quite a few coming from Frampton Cotterell, Iron Acton etc. etc. They knew the shortest distance to walk across there to Rangeworthy and across by Denis Skuse's and the footpath by Mr. Baddeley's (Hawkin's Farm) to Cromhall. So you see in those days there was quite a few hundred men working in this area and it was basically Squire Hardwicke employed them and then you had the Wainwrights and then eventually Roads Reconstruction (1934). In the meantime the railway came through in 1870 and that was a very, very big wallop because they had trucks galore, and then it (stone) was able to go out. In the meantime they was also making concrete products and where we're living now (Quoins, New Road - and still living there as at September 2013) there were, oh lor, hundreds of thousands of two inch thick slabs on both sides of the road, and if ever a photograph came forward of the slab sheds I should like a copy. My father came into Tytherington in 1908 and he was working as a set maker and that's why, as you know, the bungalow (Quoins) is dressed of stone. Well now in those days many of you going into Bristol today will call them cobbles but they are sets and were for going in between the tramlines. There was a huge number of set makers about, working in little sheds. You have a lot of people coming from the north of England, Leicestershire, goodness knows where, set making. Incidentally there was a five year apprenticeship for it. There are sets in plenty of places in Bristol, they're still there but they've been tarmaced over the top. So that was coming along and you had concrete products as well. Many of you can remember pig sty, you know where it is today in the late Mrs Daniel's garden (Ivy Cottage, Stowell Hill (now demolished)). That was a concrete product of Roads Reconstructions which they were making and, of course, they're still in it today but not in Tytherington. Now in quarrying you win rock. The proper term is that you 'win it' and to me it's always been an industry of lowly paid. I think it's caused probably because, as a natural product like North Sea oil and gas, it's liable for these things to be under priced. I think they sold it too cheap and then the wages were too low. That's been my opinion right through. When I went into Grovesend in 1938 it was a shilling an hour for labourers, 5p today to you, and one shilling and a penny three farthings top rate. Well thank goodness things have changed because it's quite a skilled industry, and believe you me if it wasn't for limestone (not so much in Tytherington as it isn't in it) there'd be no steel because limestone is the thing that makes the steel by separating the iron ore from the impurities. So from there we've gone very sketchily along breaking and loading with the numerous men, but you'll notice if you stand by Mrs Grey's (West Street Farm) and Mrs Williams (Brook Farm, West Street) and look right across that they're still on that (dipping) bedding. Well that's wrong because you've got bad quarrying practice because that's working on the beds, and if you look right across you'll see where there's been a slip. I can remember when there was a slip there and it was supposed that half a million tons came down. It made a hell of a noise during the night and there's been a slip during the day when, as far as I know, the jackets and tools and that are still there. I can remember when I went to school, where the ponds, which now I believe have been filled up, on the Castle Hill were, they used to get the water from their tip on the top, because between the beds of rock, you can see the beds quite clearly, there's a layer of clay and the idea was that the water would get on that clay and that it would gradually, which it did, slip it forward to get the slip. But they were wrong because they were quarrying on the beds, which is not done, you must quarry against the beds. 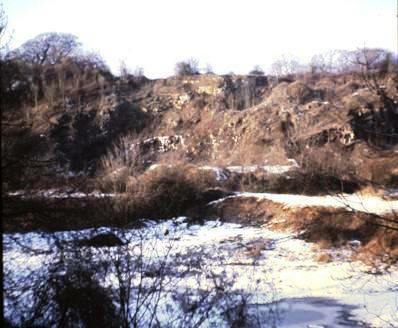 Click on the thumbnail photograph (left) which shows Castle Quarry following the landslip in 1934 which destroyed machinery and equipment and led to the closure of the quarry. In about 1928 the Church Quarry was beginning to run down, my father was one of the last ones to work down there. He was still set making and there was still a demand. Sets went out by rail and the train came right down into the quarry. The train also went up into where Hugh's (Johnson) workshop is (disused quarry on New Road) and the train also went into the main quarry, and all that went by rail. Now this is one of the most essential things, mechanisation came in but late, it came very late. It came to Grovesend in 1947 with the 54RB electric navvy. At that time there were about 40 men breaking and loading, and consequently on a wet day there was no work. That can be a subject on its own and it was the manager's worry but he was also able to say I want the best material.. In my retirement speech I said that I have seen the time when many a man has been told to get down the line and get his wages, with just two hours notice and there'd be a string of men outside the gates at Grovesend waiting to come in. Believe you me that wasn't so good, that was in the 1930's and that was not so good. Right, the 54RB came in and production went on. A new tar plant went in at Grovesend in 1960, I don't know what it's doing now but it's still at work at the present but I have known the time when it was doing 1400 tons a day. I didn't say how tarmac had come in, I said how the roads had been sprayed and put down but they were making tarmac by where Ron Moody's (main quarry West Street) paint shop is now. That was heating underneath with fires like that the stone would warmed on the top and the tar would be put on and it was mixed by hand and there are many places I could take you today past Miss Chell's (Uplands, Woodland Road) where there's a footpath where you will see tarmac on top of a wall that was obviously made by hand, and is still there today. Mostly today it's bitumen, because, as you know, there is no such thing as tar today. Well there is to a degree from the steel works but basically it's all bitumen from North Sea oil. So it came to the stage then in the 1960's when the new tar plant went in as I say they were on about 1400 tons a day. Gradually other machines came in and different types of lorries. All the time production was going up, all the time. England's still the same size incidentally so it's marvellous where it all goes, but now it was going up all the time. Albert (Godsell) will tell you now I believe last week they did 8,000 tons in a day. Well the days I've been talking of, with the breaking and loading, they were on about 6, 7, or 800 a day. They are doing more today before lunch than what they used to do in a week with 40 odd men. We have got to do something about this unemployment, we must do. You hear it all the time, but at that time there was 40 men breaking and loading, goodness knows how many drillers and loaders and about 80 men. Today you are down to about 5 or 6. So that is the wind of change! Some of you heard Mr. MacMillan (Harold, former Prime Minister in the 1960's) and believe you me that comes in the wind of change in quarrying. Basically Tytherington helped send 16,000 tons out to the West Indies, Tytherington sent 3,000 to the Falkland Islands - why I don't know. Today a rival firm, Foster Yeoman's up in Scotland - this is a matter of interest - are on up to make 6, 7, 8,000 tons an hour, not a day an hour, and they have boats going out from there all over the North Atlantic and goodness knows where. They're doing it cheaper to America than what they can do it over there, but that's just to try and keep your interest! So that is very roughly how things have gone, but the point is mechanisation came in late but the rocks are still there just the same. You can see now if you stand and look over the side they have put a tunnel now through in Woodleaze Farm to go that way towards Itchington. If you go, Bob Hetherington's (Barmersland Farm) is about the finish. The depth is about five levels now and that's about 250 feet because they're on shales now. As you're looking into the quarry that's about 360 feet above sea level and they're getting down on the shale which has a lower crushing strength and doesn't come suitable for motorways. Another point, a few years ago for sometime the lorries were belting past Mr Baddeley's (Hawkins Farm) from Cromhall. Well I expect he's noticed they don't come now because the railway that they were supplying at that time were using it for their 'high speed trains'. As trains go over the sleepers they move, the sleeper moves, the whole lot moves and so you see the rocks go together and you get wear and it breaks. So there's a test which is called an attrition test and Cromhall stone was perfect. It didn't break up when the high speed trains were travelling over at 100 and some odd m.p.h. which is what they are doing today".